You can see above my approximate route. It was rather a hectic day and I think I bit off a little more than I could chew, but damn it! I chewed none the less! 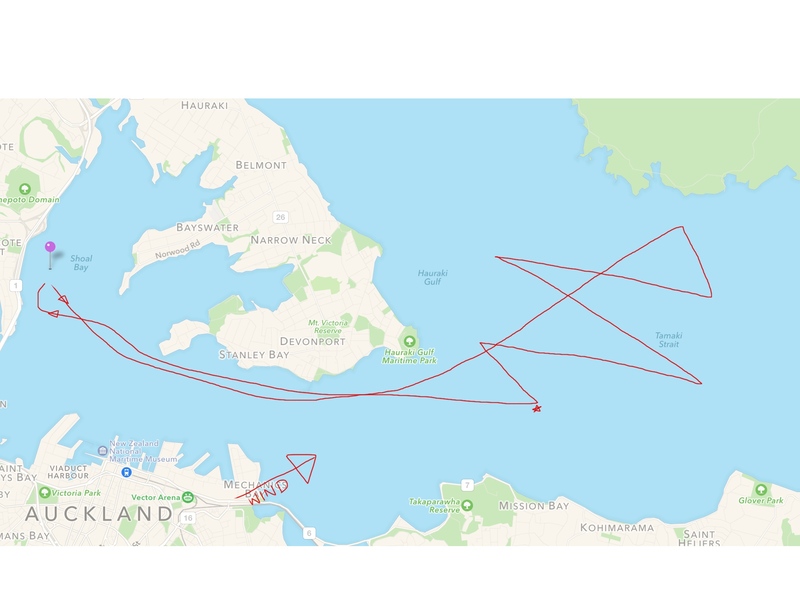 Started out pretty chill, blowing a low to moderate south westerly and I cruised slowly under the genoa alone all the way out to Rangitoto. It took probably about an hour and a half. That was when the fun started… It was around two o’clock and I thought getting on home might be a good idea, the wind had picked up and I was getting hungry. I would like to mention at this point that until now I had only ever actually completed two manouvres, which were the failed tack into a gybe and the successful gybe shown in my first sailing video. I was terrified to say the least, but I am of the opinion that if something is scary that does not mean it should be avoided, instead it should be bested, if possible. So I started a series of close reaches, tacking back and forth across the mouth of the Tamaki Straight. The boat was heeling at some points until the gunwhale was skimming the surface, and I was terrified, but it felt under control, and when the wind gusted too hard I would turn off the wind to de-power a bit. I realised after a while that I was not going to be able to point high enough to get a decent angle on the channel, and there was no way I was hoisting the main, but I persevered thinking that it didn’t matter if it took a while as I was learning a lot. As I was approaching the star marked on the map a stronger than usual gust hit, and I tried to turn off only to have the boat wrenched down at the nose as the sails caught the full force of the wind. The prow nearly buried and there was an awful groaning. I was terrified, somehow even more terrified than my ambient level of terror. I loosed the sheets, pulled down the sail and jammed it into the anchor well. Then I turned on the motor and blasted head first into the force five wind and waves for the 40 minutes it took me to get home. Once moored I ate an entire packed of chocolate chip cookies and drank some lovely warm tea. The sugar and warmth restored a bit of sanity, just in time for the winds to drop… Typical. But now I know to turn INTO the wind to de-power.